Soldiers of the Great War who paid the ultimate sacrifice would be expected to be found buried in the Commonwealth War Grave Commission (CWGC) cemeteries in Belgium and France. However, there are four (4) men of Milton that met the strict requirement to have a CWGC headstone and they are buried in the Milton Evergreen Cemetery. There is an additional soldier, who died of war injuries but is not an official CWGC casualty, as he died “too late”. To be officially commemorated the CWGC Criteria are that the person must have died during the war in service or of causes attributable to service, during the period 4 August 1914 to 31 August 1921. Remembrance Day is based on the signing of the Armistice on 11 November 1918 but that was not the end of the war. The last of the Canadian troops in the Great War of 1914-1921 left the battle zone of Northern Russia in September 1919. The Versailles Peace Treaty was ratified on 19 January 1920, and the legislation that cancelled the declaration of war was passed on 31 August 1921. Private William James Allen #141847 is buried in Blk-050 Lot-6 8 1. He joined the 20th Halton Rifles (Canadian Militia) on 3 August 1915 and was transferred to the 76th Battalion of the Canadian Expeditionary Force. After basic training in Canada, he was shipped to England, during which time he was hospitalized for chronic kidney disease. As a result of his ailment he was shipped back to Canada on 16 August 1916 and was declared medically unfit for service on 17 February 1917. He died of chronic nephritis on 18 March 1917. Although Private Allen did not serve in active combat in the war, he met the CWGC criteria and is thus officially commemorated by a CWGC Headstone. He responded to the call of duty and served his country proudly. Private Edmund Adolphus Cooper #3112559 is buried in Blk-026 Lot-1 5 1. He was the only Milton casualty of the Great War that did not voluntarily attest but rather was drafted under the Military Service Act on 10 October 1918, during the final days of the action. Private Cooper was drafted into the 2nd Battalion, Canadian Garrison Regiment, units that were formed in the later stages of the war to provide protection of the Canadian fortresses as Halifax, Esquimalt and Quebec City, or to act as guards at internment of detention camps. While in training at Exhibition Stadium in Toronto he became ill and was never able to serve in an active capacity. He died on 14 December 1918 of influenza complicated by bronchial pneumonia. His death was attributable to service and thus he is commemorated by a CWGC headstone in Evergreen Cemetery. Trooper Harold James Dent #551217 is buried in Blk-046 Lot-1 2 2. He was an American by birth and arrived in Milton when he was 4 months old. He and his parents moved west in 1912, where he attested to the Fort Gary Horse of the Canadian Expeditionary Force on 28 October 1915. Private Dent served on active duty in France from February 1916 until he was wounded in the chest during a raid to cut the German wire with Bangalore torpedoes on 8 July 1917, a brave action for which he was awarded the Military Medal. The shrapnel was successfully removed from his chest and during his recuperation he took leave to return to Canada to visit his family, prior to accepting an Officer’s Commission in the Imperial Army. It was during his trip home that he succumbed to complications from his wounds while in transit in Halifax on 18 April 1918. His father met his remains in Milton and he was buried in Milton Evergreen Cemetery. Trooper Dent is not memorialized on either the Victoria Park or the Haltonville Cenotaph, although his grave site is marked by an official CWGC headstone. Private Alfred James Evans #663090 is buried in Blk 053 Lot-4 7 1. An original of the 164th Canadian Infantry Battalion from Milton, he was subsequently transferred to the 102nd Battalion of the 11th Infantry Brigade, 4th Canadian Division. Privates Denyes and Crowe, also Milton soldiers killed in action, served in the same unit as Evans. They are both buried in CWGC cemeteries in France. Private Evans was injured by a high explosive shell or gunshot wound to the left arm and jaw in that Battle of Bourlon Wood during Canada’s Hundred Days (audio text). Although he received extensive medical and dental treatment, he was discharged as medically unfit in August 1920. He lived past the final date of the war on 31 August 1921 and survived until 29 June 1925. There is no doubt that he died of his wounds, but he lived too long to be commemorated under the CWGC criteria and thus does not have an official headstone, nor is he recorded in the CWGC records. Private Evans is remembered on the Victoria Park Cenotaph. Corporal William Maddocks #302221 is buried in Blk-050 Lot-1 7 1. A local boy, he attested to the 40th Battery of the Canadian Field Artillery as a blacksmith. Although he was not shot or blown up by a shell, he served actively with the Canadian Expeditionary Force, ensuring the delivery of the mounted units, until he was seriously wounded by repeated kicks from a mule to his lower back and abdomen. His back was broken. Corporal Maddocks was discharged medically unfit on 24 May 1919 and returned home to Milton in a plaster cast, his status for nearly 2 years. There are references to Maddocks at work in Milton until his death from spinal meningitis on 18 January 1920. Corporal Maddocks is officially commemorated by the CWGC and named on the Victoria Park Cenotaph. The Service Records of all the Milton Soldiers of the Great War, whether casualties or not, are currently being digitized by Library and Archives Canada. Digital copies are posted on the MHS Web Site for the Milton Soldiers as soon as they are available. 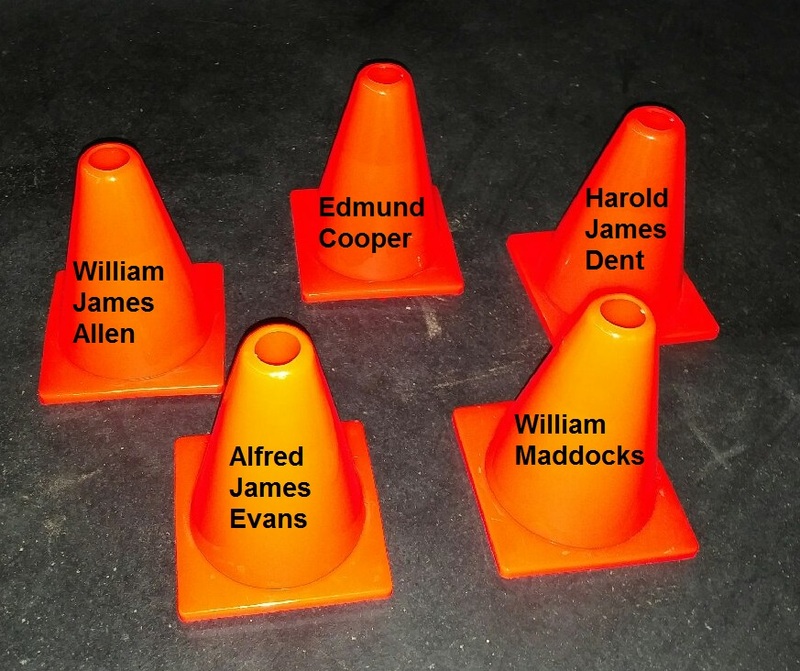 If you are in attendance at the Remembrance Day Service at Evergreen Cemetery on November 11, 2016, you will see that the five (5) headstones mentioned in this article will be marked by a small orange pylon. Please take a few minutes to pay your respects to these brave men of Milton Ontario.